From June 27th until July 2nd Tenerife and La Palma, in Canary Islands, Spain will once again be the meeting place for the World’s brightest minds in science and music. The Starmus Festival will bring together eleven Nobel Prize laureates in Physics, Chemistry, Medicine and Economics, along with experts and artists from other disciplines. In this edition will be introduced the Stephen Hawking Medal for Science Communication, that will recognise outstanding contributions to scientific dissemination in Science, Art and Cinema. Brian Eno, keynote speaker of this edition, has created a unique composition as a tribute to Professor Hawking, based on the sound of the stars. The musical agenda will feature unique shows like the Sonic Universe concert, in which Hans Zimmer, Sarah Brightman with the Symphony Orchestra of Tenerife and the rock band Anathema, will offer exclusive performances. Madrid, May 12, 2016. This morning has been presented at CaixaForum (Madrid) the programme of the third edition of Starmus Festival. Under the title “Beyond the Horizon-Tribute to Stephen Hawking”, the Festival will pay a very special homage to the professor and scientist. The presentation was attended by Garik Israelian, astrophysicist, founder and director of Starmus; Alicia Vanoostende Simili, Secretary of Tourism of La Palma Island Council; Cristobal de la Rosa, Deputy Secretary for Tourism in the Canary Islands Government and Carlos Alonso, Chairman of the Tenerife Island Council. Jill Tarter, astrophysicist and SETI pioneer, and the writer Javier Sierra also attended the event. In collaboration with the Canary Islands Government, La Palma Island Council and the Tenerife Island Council, in its third edition the festival has made a major effort to bring together top-level speakers in Sciences with major artists and musicians from all over the world to share their experiences and knowledge. Among the main activities of this year’s festival, there will be a special tribute to Professor Stephen Hawking. During four days, world-class researchers will address highly relevant global issues: the classic question of whether extraterrestrial life exists; the effects of climate change; the advances or dangers of artificial intelligence; cyber security and current network threats, or the consequences of the rising inequalities in the evolution of the economic growth. In the words of Garik Israelian: “We are living one of those key moments in the history of science in which any discovery could trigger a revolution. All speakers at this festival are directly involved in many of these revolutionary findings, and Starmus is an invitation to curious, experts, and all those who love science, to plunge into the important threats and discoveries the world is facing”. 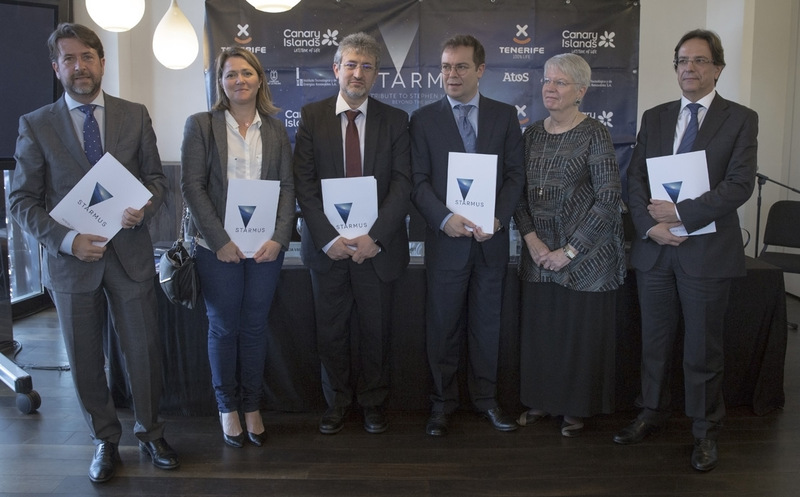 Alicia Vanoostende Simili, Minister of Tourism of La Palma Island Government pointed out that “it is an honor for the Island La Palma that the Starmus programme will hold the ‘108-minute Roundtable Discussion’ in the Grantecan, the largest optical telescope in the planet. It not only recalls the presence in our territory of world-class scientific facilities; it also backs the insular administration support for astro-tourism and the promotion of our clean skyes to contemplate the firmament. Stargazing from La Palma is a privilege for scientists and also for all those who live in the Isla Bonita or those who visit us attracted by this singularity. It was in our island, one of the few areas in the world that combines the status of Reserve and Starlight Destination- where was passed the Declaration in Defence of the Night Sky and the Right to Observe the Stars, an initiative that links directly to the spirit of this festival”. This third edition of Starmus Festival will bring together many prominent speakers, and includes eleven Nobel laureates in the disciplines of Physics, Chemistry, Medicine and Economics: Robert Wilson and David Gross, Nobel prizes in Physics in 1978 and 2004, respectively; Adam Riess and Brian Schmidt, who shared a Nobel Prize in Physics in 2011; François Englert, Nobel Prize in Physics in 2013 shared with Peter Higgs; Eric Betzig, Nobel Prize in Chemistry 2014; biologists Carol Greider and Elizabeth Blackburn, Nobel Prize in Medicine shared in 2009; Marriage Edvard Moser and May-Britt Moser, both Nobel laureates in Physiology or Medicine in 2014, and Joseph Stiglitz, Nobel Prize in Economics in 2001 and Nobel Peace Prize shared in 2007 for his work started in 1995 as a member of the Intergovernmental Panel on Climate Change. In addition, the festival will bring together the most renowned astrophysicists the world such as Neil deGrasse Tyson, Kip Thorne and Martin Rees. It will also be attended by the evolutionary biologist Richard Dawkins; Professor of Astronomy and Astrophysics head of the University of Oxford Steven Balbus, and Professor of Physics at the University of Manchester Brian E. Cox, best known to the public as host of scientific TV shows. The topics they will address will range from the future of space exploration to black holes, along with the origin and future of the universe. Also, the space race will be represented by US astrophysics Jill Tarter, pioneer and promoter of SETI Center (Search for Extraterrestrial Intelligence) and one of the world leading scientist regarding the search for extraterrestrials life. Among the speakers the audience will find legends such as the astronaut Michael Lopez-Alegria, Garrett Reisman, Claude Nicollier and Rusty Schweickart, best known as the Lunar Module Pilot on the 1969 Apollo 9 mission and former president of the B612 Foundation, a non-profit organization dedicated to defending Earth from asteroid impacts. Furthermore the event will be attended by Russian cosmonauts Roman Romanenko, Sergey Volkov and Alexei Leonov, the first man to perform a spacewalk, who has participated in the Starmus Festival since its inception. One of the novelties of this edition will be the award of “Stephen Hawking Medal for Science Communication”, presented by Stephen Hawking himself, in recognition to contributions to scientific dissemination in the areas of Science, Art and Cinema. For restless minds, another highlight will be the “Ask Hawking” competition which, as in the previous edition, will give the opportunity to a non-expert audience to pose questions to the great scientist, a unique chance for a less specialised public to reach to the great scientist. A 108-minute roundtable discussion will take place inside the dome of the giant GTC telescope (the world´s largest optical reflector) at Roque de los Muchachos Observatory on the neighbouring island of La Palma. This talk will bring together a distinguished panel of experts such as Alexei Leonov, Claude Nicollier, Sergey Volkov, Michael López Alegría, Garrett Reisman, Roman Romanenko and Rusty Schweickart. At the end of the week, Art, Music and Science will meet under the same roof in the great Sonic Universe concert. Thanks to the soprano, music icon, actress and ambassador for UNESCO, Sarah Brightman, and the Tenerife Symphony Orchestra, you can enjoy a unique show with stunning visions of the universe. A journey through space, where the audience will glimpse from the bursts of explosive celestial energy to the nebulae’s static beauty. Brian May, former Queen guitarist and Rick Wakeman, from the progressive rock group Yes, will once again be among the guests in this edition. Exclusively for the third edition of Starmus, Brian Eno has created a musical composition based on the actual sounds of the stars gathered by Garik Israelian’s investigations. Chris Hadfield and Rick Wakeman will pay a special tribute to David Bowie, through singular interpretations of the legendary songs of Bowie such as Space Oddity and Life on Mars. The closing of the musical agenda will come from Liverpool with the intensity of the rock band Anathema. Starmus Festival was born with the aim of making the most universal science and art accessible to the public. The Festival brings together the brightest minds from astronomy, prominent space travellers, astrophysicists and stargazers with tech business leaders and creative industries thinkers to debate the future of humanity. After two ground-breaking editions in 2011 and 2014, gathering together the most important representatives of these fields, such as the astronaut Neil Armstrong and Professor Stephen Hawking. In this new edition, the Starmus III program will include the participation of eleven Nobel laureates in disciplines such as Physics, Chemistry, Medicine, Astronomy, along with other guests of great prestige. Tenerife and La Palma, as leading astro-tourism destinations, are the privileged venues for Starmus Festival for the third time. Tenerife is acknowledged as one of the best locations in the world for stargazing due to the low level of light pollution in the archipelago, and in recent decades both Tenerife and La Palma have established themselves a centres for researching and observing the universe, with two unique world-class observatories: Teide, in Tenerife, and Roque de los Muchachos, in La Palma, the latter containing the world’s largest telescope. Additionally, the Institute of Astrophysics of the Canary Islands participates in some of the world’s key astrophysics projects. Since its first edition, the festival has been supported and sponsored by the Tenerife Island Government through Turismo de Tenerife, its tourist agency, as part of its ongoing bid to position the island as one of the great meeting places for the astrophysical community thanks to the privileged conditions of the Tenerife sky, coupled with the experience of astronomical observation and research accumulated by the Institute of Astrophysics of the Canary Islands and related institutions, with the result that the island is one of the world’s top locations in this field. The Canary Islands is the place with the best climate in the world for enjoying exceptional holidays any time of the year. Seven different and unique islands, perfect for disconnecting from your daily routine, recharge your batteries and return home feeling physically and mentally refreshed. The beaches, volcanic landscapes, lively and hospitable lifestyle and the possibility of choosing from all sorts of outdoor activities, as well as a wide range of quality accommodation and leisure activities mean that the majority of visitors repeat the experience more than once. Turismo Islas Canarias is responsible for promoting the Canary Islands destination brand. Created in 2005, the main goal of this public company is to study, promote and market the huge tourist offer the Canarian archipelago affords, in conjunction with the other institutions on the islands related to the tourist sector. Turismo de Tenerife is a public organization answerable to the Island Council of Tenerife that seeks to promote the values of the island as a tourist destination. Its scope also includes the regeneration of the destination or the attracting of foreign investors to undertake different projects on the island. Its management system, which includes the figure of the associates (over 500), combines different public authorities and the private sector to develop and strengthen the planning of tourist strategies. The Island Council of Tenerife is the governing, administrative and representative body of the Island. Its scope includes the provision of supra-municipal services and the coordinating of services with different municipalities from its different areas of government: Tourism, Environment, Roads, Landscape or Regional Planning, among others. Follow Starmus, Turismo de Tenerife and the Canary Islands on the social networks!